The plan was to quietly slip away from Still Rockin and Valerie without disturbing the crew just before 9am. I even bow hauled Waiouru a couple of metres in an effort to minimise the effect of any wash. All to no avail as George appeared at the stern of Still Rockin to give us a farewell wave. We might see them later as they are also intending to head south. 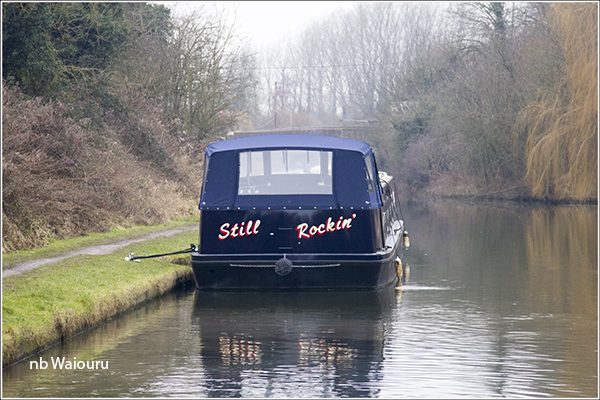 We only saw one boat on the move during the day and that was on the way to Cowroast Lock. There’s a water point immediately before the lock and there was a brief crew discussion whether to stop and top up the tank prior to going into the lock. The tank was only filled yesterday but we try not to miss the opportunity to top up the tank. You never know when you might be unable to move! There we were minding our own business watching the tank fill when a CRT employee arrived at the lock to open both top and bottom paddles before hanging a small sign on the top gates advising CRT were running water down through the pound. He then asked us to wait above the lock because the long pound between Dudswell Bottom Lock and Northchurch Lock had been totally drained overnight. CRT were both pumping and running water down to the pound. I walked down to check on the situation. By the time I reached the top of the pound CRT had been running water into it for 30 minutes (photo above). The pound had been completely dry and the CRT employee lamented the fate of the thousands of fish that had been in the pound. He explained some had been over 20 pounds. I was advised we might have a long wait. With nothing to do and being on a water point I decided to give the port side of Waiouru a wash whilst Jan gave the shower a polish. I’d almost finished when to my surprise Mick (nb Lillyanne) appeared on the towpath. I knew they were down south at Hemel Hempstead on the other side of the stoppage. Mick explained he had caught the bus up because he wanted to visit the chandlery at Cowroast Marina. 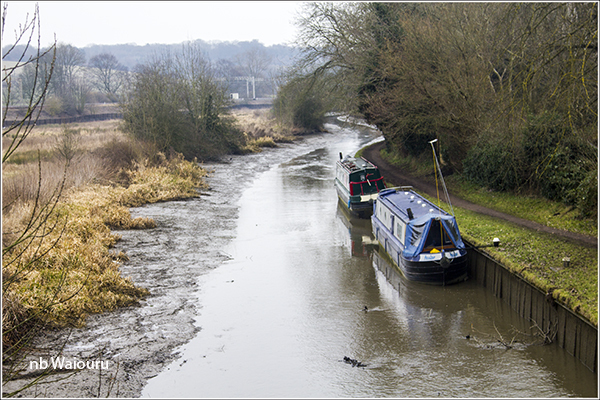 We had one of those towpath boater conversations which included a discussion about summer cruising plans. It’s possible our cruising paths might cross later in the year. I noticed CRT were pumping water into the summit pound because the outlet pipe was immediately in front of Waiouru. The pump house is to the left of the above photo. I noticed it had the year 1943 on a date plate above the doors. 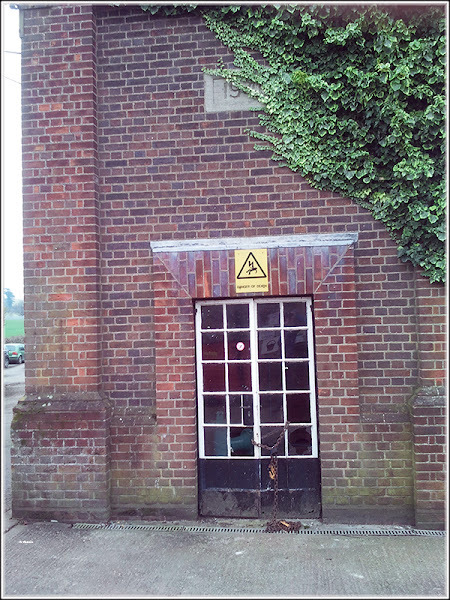 My assumption is the pump house was constructed as part of the rejuvenation of the Grand Union Canal in the middle of the last century. That the building was constructed during WW2 leads me to conclude canal traffic was essential to the war effort?. It appears the pump house can supply water above and below Cowroast Lock. I did ask the CRT employee if they were back pumping and was informed this wasn’t the case. The water is drawn from a bore. 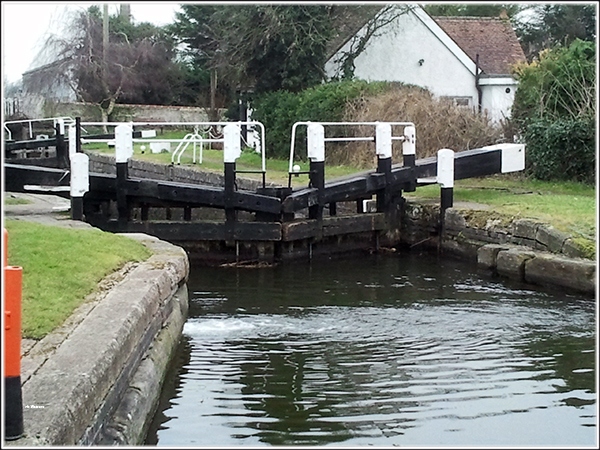 CRT reopened the canal after four hours and Jan immediately went forward to fill the lock. One unexpected consequence of the four hours of running water down from the summit pound was the debris that had been carried by the flow. This included Mr Badger who had either slipped into the canal or fallen in after drinking too much. He was loitering around the top gates of the lock. Jan opened the opposite gate in an effort to keep him out of the lock but he was having none of it and preceded Waiouru into the lock. He then made a nuisance of himself by hiding behind the lower lock gate Jan wanted to open. I did point out Mr Badger to the CRT worker and was advised that in earlier days they would have pulled him from the water and buried him. But the current policy is they are not to attempt the “kiss of life” but arrange for a specialist contractor to remove him. 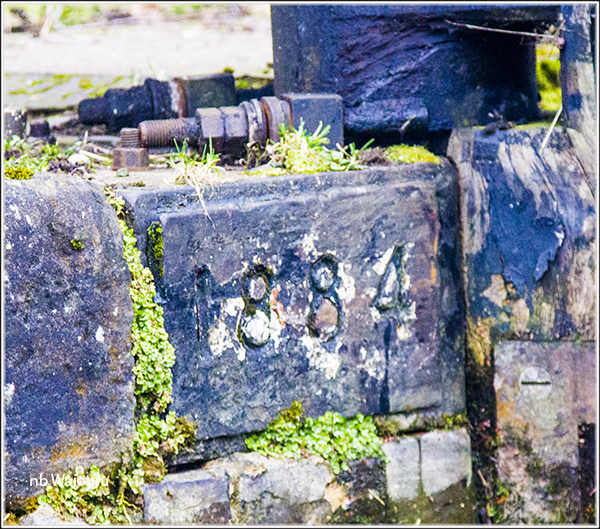 Interesting to note the dates on the lock coping stones. We reached Berkhampsted at 4.30pm and realised finding a mooring might be a problem. There are new council “No Mooring” signs on the off-side where there is a park and it looks like many of the boaters who had been evicted moved to the towpath side. There was a vacant mooring close to Waitrose but there were a number of stacked wooden pallets and a pile of uncut logs on the towpath and of course the most Important piece of equipment the wheelbarrow I guessed some boater had left their firewood and gone to the nearby waterpoint. The mooring was vacant but I decided I might lose the arm wrestling competition to retain it. In the end we managed to find a space we just squeezed into before Berkhampsted Lock. We’ll only be here for the one night.